Jim’s August 1970 trip to Los Angeles was to sit in on the planning and rehearsals for Flip Wilson’s variety show, Flip, scheduled to tape at the end of that week and air on October 15th. Caroll Spinney came out to perform Big Bird and Oscar accompanied by the Muppet builder and handler Kermit Love. While Jim went back to New York once everything was in place, Spinney and Love stayed on an additional week to tape a second appearance that would air as the show’s premiere on September 17th. The Muppets were guests twice more on Flip. For the November 11th, 1971 show, they performed their popular “Java” piece featuring abstract dryer-hose characters dancing to the jazz composition of the same name made popular by trumpeter Al Hirt. 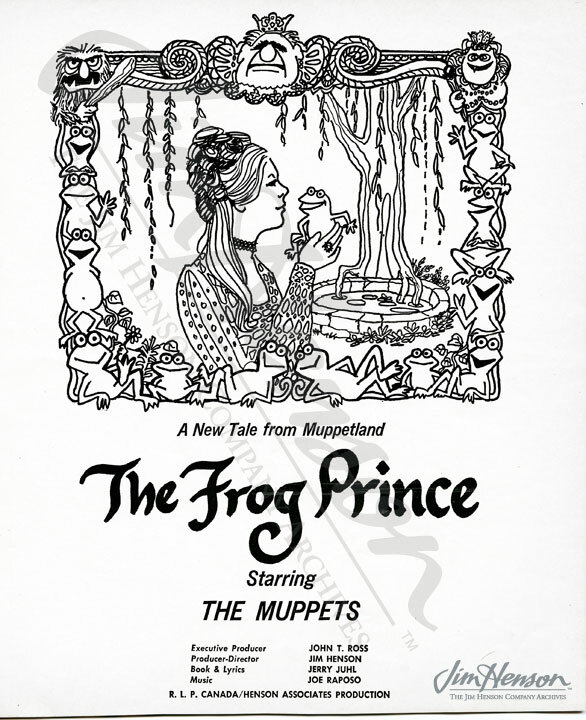 Taped the month before, Kermit also chatted with Diahann Carroll, soliciting a kiss, and they did a piece with Flip and Dom DeLuise that Jim described in his journal as “Frank’s drunk” referring to a character performed by Frank Oz named Marcus Welby who had a bad case of hiccups. The show ended with Jim and Frank performing two blank faced Anything Muppets. Bantering with them, Wilson charmingly gave them eyes, eyebrows, and other facial features. Once everything was in place, the trio joyfully sang “Consider Yourself” from the musical Oliver! 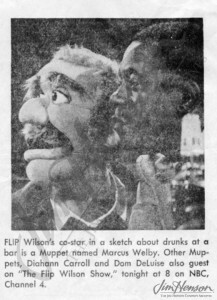 Learn more about the 1970 Muppet appearances on Flip Wilson’s show. Flip Wilson with Frank Oz’s character Marcus Welby on Flip, November 11, 1971. 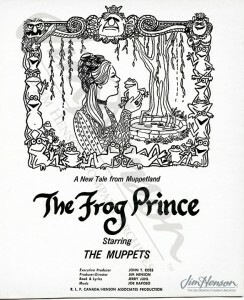 There were plenty of frogs available for appearances left over from Jim’s 1971 television special, The Frog Prince. This entry was posted in 08-August '70, 1970, Appearances and tagged Al Hirt, Big Bird, Burr Tillstom, Caroll Spinney, Diahann Carroll, Dom DeLuise, Ernie and Bert, Flip Wilson, Frank Oz, Jack Benny, Kermit Love, Marcus Welby, Oscar, Pearl Bailey. Bookmark the permalink.